One of Marina�s goals as a teacher and musician is to educate the community about music and the harp. To come closer to realizing this goal, Marina created this demonstration and lecture, which targets all schools in Reno and the surrounding areas. The length and content of the lecture can be tailored to different age groups, and can therefore be done at elementary through college levels. 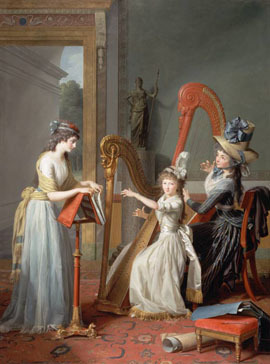 In a typical forty five minute demonstration, Marina talks about the history of the harp with visual examples on a power point presentation; the construction of a lever harp and music that can be played on it; the pedal mechanism and playing techniques of the pedal harp; and the latest innovations in the construction of the instrument together with examples of inventive playing techniques used in modern music and Jazz. Each demonstration includes numerous musical examples performed by Marina, related to the various topics being discussed. Musical examples are performed on both the concert grand harp and the smaller lever harp. In addition, a few students are invited to participate in a hands-on experience of how to execute certain sound effects on the harp. At the end of each session, time is dedicated for answering audience questions and reviewing the main topics discussed. 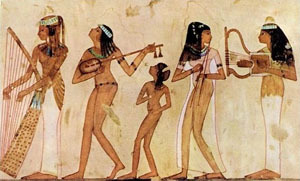 Each participating class receives a colorful and informative poster which covers the historical evolution of the harp, to be hung in their classroom. Also, there is an optional homework assignment sheet for elementary schools, which addresses the important details covered in the lecture and can be printed out for each student. 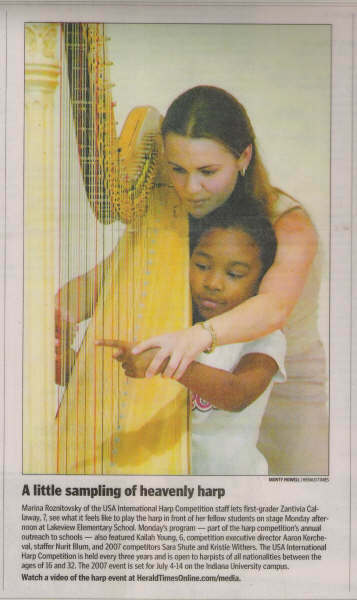 Contact Marina to schedule the "Harp A-Z" presentation at your school today! Read the Herald Times article about Marina.